An expedition from West Yorkshire is being criticised for being badly equipped after two young boys had to be rescued on Snowdon. Some of the 27-strong group were only wearing trainers and jeans to climb to the summit, said the Llanberis Mountain Rescue Team. 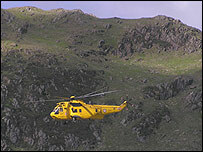 The two boys, aged nine and 11, and two adults became stuck on the slopes of Crib Goch in low cloud, on Sunday. The rescuers said the walk should have been abandoned because of the weather. The two youngsters suffered slight hypothermia in the alert which began with a 999 call to say they were lost at the summit, but did not say which one. There were 26 people involved in the search. 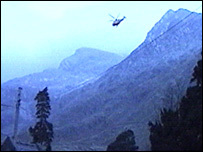 One of two men in the group made his way down the mountain and was able to point out the youngsters' location, on a ledge at Crib Goch, two-thirds of the way up the mountain. The boys had been told to sit tight and wait for rescue, which came when rescue team members used ropes to bring them down. Dr Gwyn Roberts, of Llanberis Mountain Rescue Team, said it appeared the boys and two adults with them had "strayed away" from the main party. He said: "We think they may have inadvertently followed other people on the mountain and this had led them on to the slopes of Crib Goch which is a very narrow ridge, one of the subsidiary peaks of Snowdon. "At that point they managed to get themselves to a position where they couldn't move up or down, they're on steep, rocky ground, very wet, they were in cloud and rain and they made a call for help at that point." Getting the people down was difficult, explained Dr Roberts, as they were on rock and had to be lowered to walking ground using several rope lengths. He said: "By that time there was some concern about possible hypothermia for the kids, they were actually carried on the backs of a couple of team members down to the awaiting helicopter." They were winched into the Sea King rescue helicopter, based at RAF Valley on Anglesey, and flown to Ysbyty Gwynedd in Bangor. Dr Roberts said weather conditions had also been difficult with driving rain and very cold winds. "Several of the party were wearing trainers" said Dr Roberts. "They were obviously all pretty wet and soaked through by the time we got to them. However, he said the biggest issue was that the party had got completely spread out along the mountainside. Dr Roberts advised any party to be ready to adapt their plans or turn back if weather conditions are not as expected. He added: "Fortunately the guys, the lads here are going to make a full recovery but the position they were in was potentially very serious and things could've turned out differently."